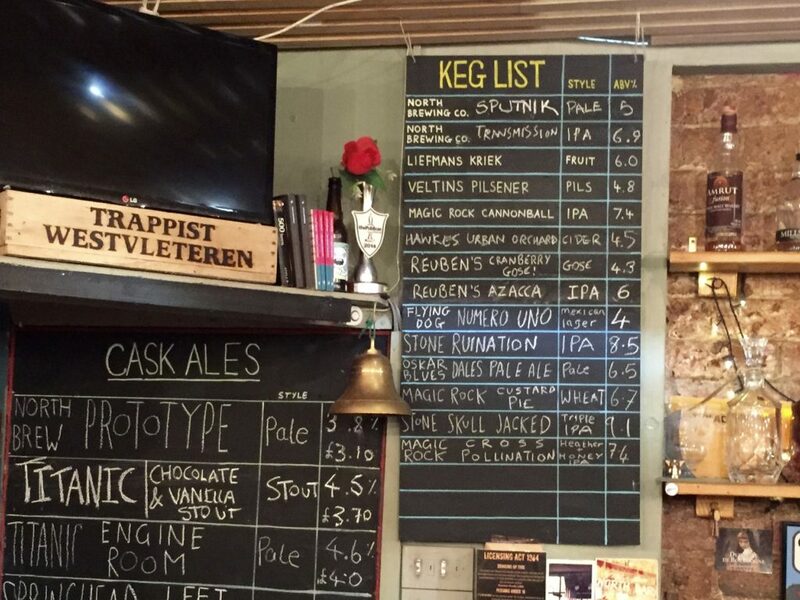 Why is keg craft beer more expensive than cask beer and ale? To find out, I asked some of the south’s top brewers and publicans. Here’s what I learnt. Kegs – through their association with bland, mass-produced beer and lager – used to be a dirty word when it came to quality beer and ale. While some real ale stalwarts will only drink draught beer served from a cask, savvy drinkers recognise that there are now lots of decent craft keg beers available in the UK. Whether or not cask beer is better then keg (and vice versa) will always be up for debate. One thing we can all agree on though is that the cost of craft keg beer is generally more expensive than cask beer. For instance, at the Overdraft micropub in Southampton, all cask ales are a flat price of £3.30 while all keg beers are £1 (30%) more expensive at £4.30. There are similar differences at the Butcher’s Hook, also in Southampton. When I checked there recently, the average price of a pint of cask beer (with an average ABV of 4.5%) was £3.53 while the average price of a pint of keg beer (with an average ABV of 6%) was £5.46 – 54% more expensive for 33% more alcohol per serving. It’s a similar story across the UK – last year, Inapub reported that the average price of a pint of cask beer is £3.24 versus an average of £4.26 for a pint of “craft” keg beer. That’s a price difference of 31%. How much does a keg of beer cost pubs? Pub, bar and restaurants face similar price differences when they buy their beer. For instance, at drinks wholesaler Dayla, a 40-litre cask of Tiny Rebel’s “Cwtch” is £86.00 (£2.15 a litre) while a 30-litre keg of the same beer is £86.99 (£2.89 a litre). That’s a price difference of 34%. However, the difference isn’t as high at all wholesalers. For example, at Small Beer Ltd, the difference in price between a cask and keg of Bath Ales’s “Gem” is 23% – £1.97 per litre in cask versus £2.44 per litre in keg. Why is keg more expensive than cask? So, why is keg craft beer more expensive than cask beer? Are we simply getting ripped off when we drink keg beer? Or are there genuine reasons why kegged craft beer usually costs more to buy than cask? To find out, I asked several south-coast publicans and craft brewers about their experiences with keg and cask beer. Here’s what I learnt. There are actually many potential cost-saving advantages to both brewers and pubs when they choose keg over cask. 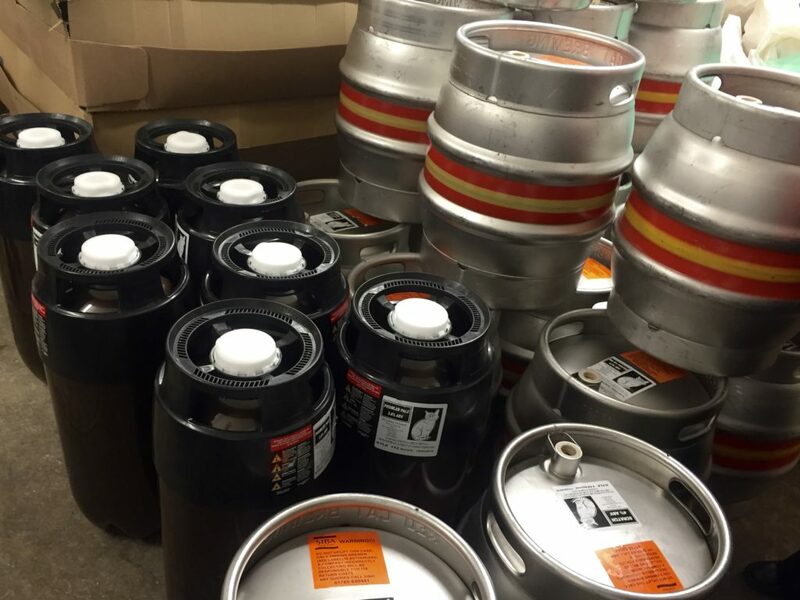 In pubs, kegs are easier to store and manage than casks. “It takes a great deal of skill to keep and serve cask beer in good condition,” says Jim Fullegar, owner of Broken Bridge Brewing in Swanmore near Southampton. Broken Bridge has recently begun producing beer in kegs as well as cask. Another advantage of keg beer for pubs is that it lasts longer than cask – several weeks instead of several days once opened. So the quality is more consistent over its lifespan. This means the pub can have a greater range of beer on at any one time, which “attracts a wider consumer base,” says Faye Pain of Winchester’s Red Cat Brewing. Kegs offer pubs more flexibility too. “You can decide what you want to put on without having to tap, vent and wait for it to be ready” says Steve Lee from Southampton beer and gin bar, Belgium and Blues. The main advantage of keg beer for breweries is more control over the quality of the beer, because there’s less opportunity for publicans to ruin it through poor cellar management. “There’s nothing more disheartening for a brewer to see their pride and joy managed badly in a cellar,” says the Bear Beer Family’s David. “That [poor cellar management] is all too common an occurrence in this trade,” adds Vibrant Forest Brewery’s Andrew Mathews. Breweries that use disposable “one-way” kegs have another advantage over those that use casks and steel kegs because they don’t need collecting or cleaning after use. One-way kegs also allow them to send their beers further afield or even abroad without needing to pick up the empty casks afterwards. In many other industries, these benefits to pubs and brewers would make keg beer less expensive than cask. Why then are drinkers paying more – not less – for keg beers at the bar? One reason could be the upfront cost of each unit when breweries use disposable kegs. However, this arguably cancels out the costs incurred with washing and collecting casks. So it shouldn’t result in such a price difference when the beer reaches your pint glass. There’s also the cost of the equipment required if breweries decide to start supplying beer in kegs. Again though, this should balance itself out as it’s not a direct cost to add to the price of each pint at the bar. “If you buy a new van instead of an old van to make deliveries then would you add the extra cost onto the product? No you wouldn’t!” says Steve from Belgium and Blues. It’s worth remembering that keg craft beers are more likely to use premium ingredients or additional hops, which adds to the cost for the brewer. They’re more likely to have a higher alcohol content too, resulting in breweries having to pay more beer duty to the Inland Revenue. However, this isn’t the case for all kegged craft beers. So it doesn’t explain the price differences we see across the board. There are also several benefits for drinkers that could justify why keg beer is more expensive than cask. As well as offering consistency in quality and condition and a bigger range of beers in venues that may not turn over enough beer to warrant a large variety of cask beers, some beers are better when kegged. “Many beer styles present better in the glass from keg, especially continental styles and pales,” says the owner of Red Cat Brewing, Iain McIntosh. The extra fizz you can achieve with keg beers is another benefit to drinkers. “Beer aroma is carried better by the carbonation from kegging,” says Jim from Broken Bridge. However, while some of these benefits to drinkers could explain why certain beers are more expensive than others, none really justify why the same beer costs more on keg than it does on cask. So far we’ve learnt that keg beers provide many advantages to publicans and brewers, but fewer benefits to drinkers. So, what’s the real reason why keg beer is more expensive than cask? Put simply, it’s to do with drinkers’ expectations on the price of cask beer and keg beer’s profitability. Over the years, this has influenced drinkers’ expectation of the price of cask beer. “People expect to pay a certain amount for cask beer, and that keeps it deflated,” says Andrew from Vibrant Forest. Broken Bridge’s Jim agrees with Andrew and Faye: “Cask prices are partially set by public expectations. These public perceptions seem to be set by the huge breweries selling cheap to make beer for very little. But how can breweries sell the same keg beer at a higher price than cask? “As keg beer is relatively new, and it’s appealing to a wider market including a younger and more diverse audience, breweries are able to put a more realistic and sustainable price on their keg products,” says Red Cat’s Faye. There you have it – keg beer is more expensive than cask because drinkers will pay more for it. And who can blame the breweries for charging more? Not only do they get all the benefits of keg and avoid the hassle of cask, but they can make more profit too. Of course, you could say the higher price of keg beer is a sign that craft brewers are ripping us off or putting profits before passion. We shouldn’t forget though that breweries are businesses. And, like all businesses, they have to eventually make money to survive. That’s why the difference in the price of cask and price of keg should worry you if you love cask beer – if smaller breweries struggle to make a profit on cask beer, moving to more profitable keg is a no brainer for them. Ultimately, that would leave us with less choice of cask ale at the bar. After all, some high-profile breweries, including Cloudwater and Buxton, have already ceased producing cask ale. Sure, it’s only a handful of breweries so far. But I’d be pretty annoyed if I could only get my favourite cask beers on keg in the future. The difference in price might also concern you if you only drink keg beer because, arguably, you’re currently subsidising the price of cask beer in some cases. You might also like: Are kegs taking some of the ‘craft’ out of UK craft beer? Clearly then, breweries – especially the smaller ones – need to charge more for their cask beer so it continues to thrive. The question is, will cask beer drinkers pay more? And will we ever reach a time where beer is priced based on the ingredients used and effort that goes into producing it, instead of what container its served from? After all, drinkers quite happily pay a premium for mass-produced beers and lagers like Guinness, Stella Artois and Peroni as well as artisan gins and fine wines. Why not cask beer too? “I would encourage people to support their local independent pubs and never scoff at the price of a pint,” says Jim from Broken Bridge Brewing. There you go. Brewing great beer isn’t easy – don’t take it for granted. Does to higher price of keg beer or lower price of cask beer bother you? Would you be prepared to pay more for your beer? There’s more analysis of the price of cask beer in these excellent posts by beer writers James Beeson and Matthew Curtis. Massive thanks to Faye, Iain, Jim, Steve, Andrew and David for their help with this post. Jim from Broken Bridge Brewing will not be getting any support from me then, with that attitude. Supermarket bottles for me then. The reason is tastier beer in the UK is taxed 30% higher unfortunately. Is that because of the higher strength/ABV? There’s a few important points missed regards production. Beer packaged in keg spends more time in tank, is cooled to lower temperatures, is (sometimes) force carbonated, is packaged under pressure. All of these things carry additional costs, be it chems and heat for extra cleaning, co2 for purging, transferring, carbonating and filling, energy used for cooling, not to mention additional time and labour. All this time and effort could be spent brewing another gyle of ale intended for cask. This is my experience of course and may not be the same across the board. Thanks for your insight James. Those factors didn’t come out of my (very limited) research but others have mentioned this too. So what is this tax on “taste” alluded to? Microbrewers get small brewers relief of up to 50%. So if the tastier beer is produced by a brewer producing less than 60000 Hectolitres, they are paying less duty than the industrial producers. Because earning a living is so looked down upon in this country… and you have your folk who see only price and think of beer as a commodity alcohol delivery mechanism. 1) Use the cheapest kit, probably 4th hand Dave Porter kit, and brew up some relatively dull 4.2% alcohol delivery liquid that’s not too offensive if not exactly consistent and sell beer in variable condition racked ASAP at a supposed “market rate” of £60 a firkin. 2) Buy in state of the art equipment fresh from manufacturer, ensure you’ve got brewing _skill_ on board (trained or experienced brewers) – and let them use the best quality ingredients on the market, and more of them. Brew a 4.2% session IPA – big hop rates, significant dry hop additions. Proper time to rest, no rushed brews. Chill & rack good clean beer. And work with a market that expects your 4.2% beer to cost the same as chap 1’s. For many breweries that’s about the position of it. So chap 2 needs to differentiate – and that is hard, you spend even more promoting building a brand, getting some recognition and loyalty. And even then 95% of the market wouldn’t pay more than £60 for your cask. Chap 2 may well love cask… but he loves good beer more than he loves a given format, and, well, keg is another market… where his beer that is well worth more may get the margin it needs to exist. This is assuming an equal footing of full beer duty relief. What we may be seeing now though is pretty bland stuff doubly unsuitable for keg format like Bath Ale’s “Gem” hitting keg too purely to leverage fad & margin … and just perhaps the days of good keg beer being worth brewing are limited by the relentless price pressures of bland beer. But I like to hope that UK eyes are being opened to beer diversity and quality. Starting your research by looking at the prices at a couple of micropubs is going to skew your figures right from the start. Charging the same price per pint across a selection of cask beer is almost unheard of anywhere else. Next, quoting prices (excluding VAT by the way) from distributors is going the skew your figures as well. In my experience all distributors charge a hefty percentage to act as the middle man (often flogging on beer near its sell by date or beers the breweries found hard to shift). Buying direct guarantees me a far lower price on my beers, cask or keg. Now, let’s look at the many other differences between cask and keg beers which you don’t mention. Casks: brew the beer, pour it into the cask, hammer in a couple bits of plastic, load it on the van and off you go to make a delivery. Publican puts it in the cellar, vents it and uses a manual pump to pull off the beer. Kegs: brew the beer in a slightly different and more time-consuming way as James Smith has mentioned in his comment (not cheap), pour it into a keg which is built in a completely different way to withstand pressure (not cheap), depending on the beer/process used by the brewer set it aside (or even ship it off somewhere else) for carbonating (not cheap). Eventually load it on the van. Publican hooks it up to a completely different dispense system (not cheap to install) which requires a steady supply of gas cylinders (cheap, but not free) to pull the beer through a chiller unit which runs 24 hours a day (not cheap). From the minute it is brewed to the moment a customer lifts up the glass, it’s a different product (even the glass will be different). Yes, there is less ‘management’ *once in the cellar*, but more time & effort are involved in getting it into the cellar and more money is spent serving it when compared to the same beer in cask. Not all kegs are one-way disposables, steel ones need picked up and cleaned by the brewery before they can be used. Cleaning them is far more involved than a cask, it’s not just a matter of sticking a hosepipe in and giving it a swirl. One-way disposables are expensive: a single Key Keg costs as much as £20 and even buying in bulk (like, thousands at a time, which they need stored somewhere) the price will still be around £15/unit. Keg beer is more expensive because it is more expensive to make. All ‘indirect costs’ as you call them add up and need to be covered somewhere along the way. It’s not just the resources used that determine the price of a product, but the time, labour and even the space used also have to be factored in too. If not, then what you’re saying is the smile on customers’ faces as they drink something brewed with passion is payment enough for everyone involved in getting that beer in their hands. And we’re not touching on duty (which the Tories have just increased), the inflationary pressures of Brexit and the depressed pound, or even the hops shortage. Keg beer costs more to produce, but ripping off customers doesn’t have to be the end result. For instance, I’ve made the business decision to sell keg beers at my pub on a lower profit margin than cask. Thanks for commenting – some really interesting insights in there. It sounds as though I could some some deeper research on this topic! I hope the conclusion in the post is clear that I don’t think keg beer is actually a rip off (hence the ? in the title!). Although I must admit I did think it was overpriced I started researching it – I’m a lot more open-minded now. This is an interesting topic, and I can see that you’ve given it a good try. 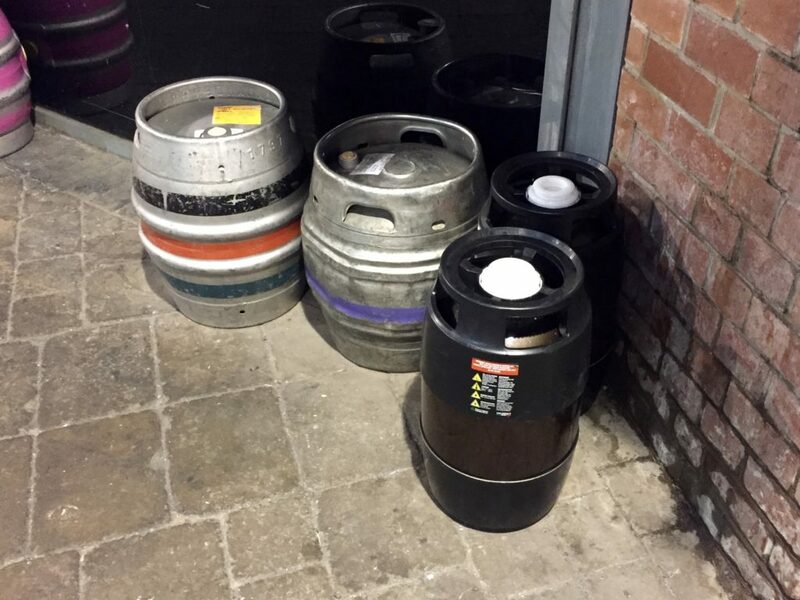 I think there will be many opinions on the reasons for the difference between keg and cask beers in some Southampton venues, and you have gathered a few. Though I’m not sure how accurate some of those opinions are, as a number of statements in the article do not sit well with my own experiences. The view that “Beer aroma is carried better by the carbonation from kegging”, for example, is an interesting one. While largely this does not sit well with the known research on the matter, I can see how this perception can arise in certain circumstances. Forced carbonation does have an impact on beer flavour and aroma, generally bringing out a slightly higher degree of salt and sour, or a general perceived higher “acidity”.- though it tends to mute other flavours and aromas within the beer. This salt/sour (acidity) flavour can sit well with a beer where the drinker wishes to focus less on the malt, and more on the sharpness – such as with lagers, or modern craft beers with high alpha acid hops. The aroma of the beer is not being carried by the carbonation; rather, the carbonation is introducing its own acidity into the beer. You can discover this yourself by experiencing the aroma of a still glass of water next to a glass of sparkling water. Shake the still water as much as you like, and you will not replicate the same aroma of the carbonated water. Brewers do experiment with the condition of their beers to see what level of carbonation is best suited to delivering what their target market expects and would appreciate. I think a statement like “Our target market expects and enjoys a higher level of carbonation with hoppy kegged beers” is perhaps more accurate, but a little too prosaic and business oriented. It is way better PR to say “Beer aroma is carried better by the carbonation from kegging”, as that is what the target market is wanting to hear! Ah. I didn’t mean to suggest you changed the comments, rather that the comments themselves are perhaps conveying inaccurate and misleading information. Ask twelve people in a pub why they think keg is more expensive than cask and you’re likely to get twelve different responses or opinions – some of those responses will be more accurate than others. I tweeted you a link http://www.wishbonebrewery.co.uk/2017/07/16/same-beer-cask-vs-keg/ but this should shed some light on part of the cost difference. What I do not know is individual Bar/Pub overheads. Thanks. That’s an informative post and very interesting.